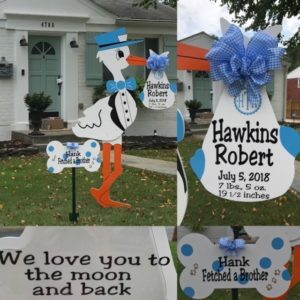 Flying Storks has the most adorable lawn Sign Birth Announcement Storks in all of Maryland. For about the cost of sending Flowers, call and order your Personalized Stork Sign Yard Card Birth Announcement Today! $99 includes, delivery, pick up, and all Stork Bundle Keepsake customization.